Spiritualism was, unsurprisingly, one of the great enthusiasms of the two decades after the First World War, and although the movement had existed before this time, and continues to exist today, it was those decades which gave it the impetus and the money to put up proper churches on prominent sites. 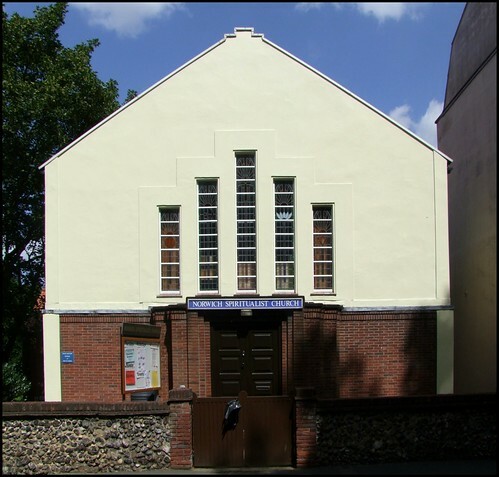 Norwich Spiritualist Church sits on Chapel Field North overlooking Chapelfield Gardens, and is a fine small example of the Art Deco style. The community came together in the early 1920s, and the foundation stone of this church was laid in 1936. The photographs of the inside of the church on its website show the bare dark wood and brass that you would expect of the Art Deco style. The main rooms have flat ceilings and blue carpets.It cost a total of £3500 to build, and is much bigger than its frontage suggests. Brass plaques along the rostrum record the names of those who raised the money for the building in the 1920s and 1930s.